Here is a list of antennas that can be used to receive WTJR depending on your local conditions. 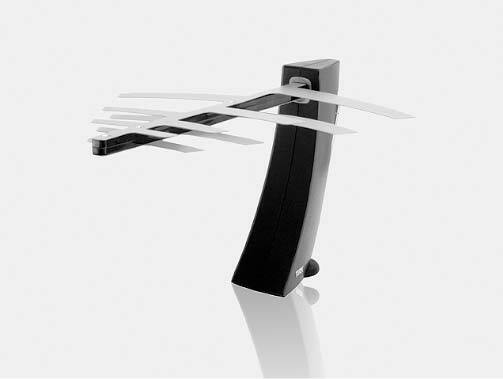 Please read our separate webpage about what antenna to select. What antenna do I need? Antenna rages are estimates only, and depend on reception antenna direction (at your home), antenna height, building(s), outdoor terrain (hills and valleys), atmospheric conditions. In addition DTV Transmitter antenna direction, transmitter antenna type,( directional or omni), antenna height and the television stations effective radiated power have a major effect. High quality construction - made in the USA! Product Description From the Manufacturer The high-performance HDTVa amplified indoor HDTV antenna from Terk Technologies is designed to capture both UHF and VHF signals (channels 2 to 69) while extending the reception range for all local HDTV broadcasts. The HDTVa uses an ultra-low-noise, high-gain amplifier with Terk's exclusive Dual-Drive Amplifier technology for clear reception of both distant and close HDTV and DTV stations. Capture both UHF/VHF signals while extending the reception range for all local HDTV broadcasts. Click here for a larger image Features a curved, tapered, polished-aluminum look. Integrated 75-ohm cable. Enjoy Full-Resolution Broadcasts Suitable for those living in city apartments as for those in suburban homes, the compact HDTVa lets viewers experience HDTV broadcasts in full resolution. Designed for total reception versatility, the HDTVa's high-gain antenna array can be oriented either horizontally or vertically within its mounting base to achieve optimum capture of off-air broadcasts. The antenna is engineered to receive all local HDTV channels, with an operating bandwidth covering both the VHF (channels 2 to 13) and UHF (channels 14 to 69) frequency ranges. Its highly directional log periodic UHF and precision VHF elements are designed to receive HDTV broadcasts with maximum signal strength while rejecting all or most interference. Boost Weak Signals Set the amplifier to high-gain mode to compensate for signals that are too weak or might otherwise be bypassed for a stronger signals nearby. Easy Installation Simplifying your installation, the HDTVa uses Terk's Power Injector to derive power via its coaxial connecting cable. The result? One cable is all you have to connect, making it easy to install the HDTVa atop or near your television. Great Modern Looks As an added bonus, the HDTVa is as exceptional in appearance as it is in performance: its curved, tapering, polished-aluminum antenna elements are mounted in a slim base with a contoured front that visually complements the curve of the antenna elements.